Last night’s Baltimore protest was a direct result of years of police brutality and the racist undertones we still face. The civil unrest and riot stemming from the protest, was long in the making. People can only be pushed so far; there are limits to what a oppressed group can take. 2015 has proven to be that limit. While I in no way condone the violent riot we saw last night, I do understand the anger. I am angry every time an unarmed citizen is gunned down by an officer whose job is supposed to be to protect and to serve. I am angry that more often than not, this ugly abuse of power is justified as part of the job. I can’t get the image of 12- year Tamir Rice gunned down simply because he was holding a toy gun, out of my head. When I was ten my grandfather disabled a real shotgun so that we grandkids could play cops and robbers. I remember carrying it as I walked down the street to a friend’s house. It never occurred to my grandparents that the sight of a 10-year-old girl walking down the street with a gun would be threatening. Truth be told, I bought my 14-year an air-soft gun (one like Tamir Rice was holding) to target practice with his friends. I shudder to think that my son could have met the same fate. So yes, I am angry. I know, I know, the statics say police brutality has gone down over the last few decades, and that what is reported in the news only serves to make us think differently. But this fact is meaningless to those who have lost family members. It should not matter that brutality has gone down. We should have zero tolerance for those who take lethal action when there are other ways. There is no justification for murdering an unarmed citizen when we have the technology and means to defuse a situation. Escalating the encounter to such drastic conclusions harms our society and only increases what is already a palatable tension between citizens and our men in uniform. In this day in age life should be more precious. We should know better. Full disclosure, I work for state law-enforcement. I know all too well there are some scary people out there who don’t value life. Ask any cop who is willing to be honest, and you will hear that with the rise in gun ownership, everyone who is stopped poses a threat. Yet this too is not justification for violence. Yet, historically meeting violence with violence has never worked for those looking for changes within society. Yes, it works when a group decides to overthrow a government, but this usually leads to war. Changes from within come from peaceful civil disobedience. Not all government overthrows were accomplished with violence though. India was once under British rule. By the late 1920s the Indian people, viewed as second-class citizens in their own country, cried “Enough”! Led by Mohandas Gahndhi, the people engaged in satyagraha, a war without violence. The people did this by enacting civil disobedience. They refused to carry government-mandated papers. They ignored curfews and refused to ride in third class train cars among other things. The masses used these tactics as a large-scale nation-wide protest. The original goal of wanting to be viewed as equals to those who ruled them, became a wish for “Home Rule”. Ten years of peaceful protest turned to simmering rage as thousands were jailed and beaten with no end in sight. Gandhi and his supporters decided to take a stand, but there would be no looting, no burning, no violence. This stand, as ridiculous as it may seem to us, was a symbolic gesture to show the government that the people had reached their limit. In February of 1930, Gandhi and a band of twenty-eight followers marched to the sea to take something Indians were not allowed to freely take: salt. It was illegal for Indians to make their own salt. They had to buy it from British companies. 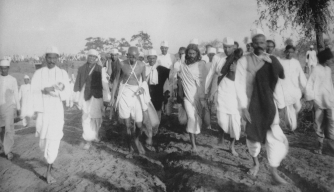 Local villagers joined Gandhi and his followers as they marched to sea. By the time Gandhi reached the sea he had thousands of people at his side. Everyone took some salt and soon people were buying and selling it. Though small, this simple gesture of civil disobedience turned the tide of opinion. Gandhi and others would be in and out of jail for the next few years, yet this was starting to become a thing to celebrate. As more and more were jailed, the more the jails became communities. Family members were often reunited in jail, causing much celebration. Jail was becoming the place to be. The world’s attention turned to India and soon the situation became a spectacle, rather than a lesson on how to treat a conquered nation. The British government felt the pressure, both from within and from without. Finally in August of 1947, India was free. Sadly the bitter irony is that the nation fractured into two: India and Pakistan. The animosity between these two young nations turned to bloodshed, with Gandhi caught in the middle. He was assassinated in 1948. Today the two countries have nuclear weapons pointed at each other. We humans sure seem bent on self-destruction. Last night’s riot was viewed around the world. News coverage was non-stop. It reminded me of another time when TV viewers sat in horror as police used every means necessary to stop protests. Only that time, it was the police, not the protesters that were out of control. The world watched as police dogs and fire hoses were used on peaceful demonstrators whose only crime was wanting to be noticed. The Birmingham Campaign was series of peaceful protests by black citizens who wanted nothing more than to be treated as equal citizens. Like India before them, they no longer wanted to be viewed as second-class citizens in their own country. The campaign started in the spring of 1963. Over the next few months, the peaceful demonstrations would be met with violent attacks using high-pressure fire hoses and police dogs on men, women, and children alike. The world watched in horror as peaceful citizens were treated as animals. As more and more demonstrations resulted in police brutality, the nation had no choice but to question segregation. 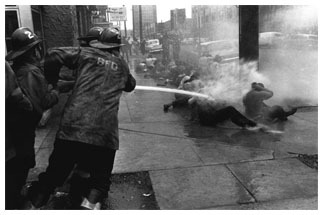 These violent images, beamed around the world, producing some of the most disturbing images of the Civil Rights Movement. Yet it wasn’t the violence that moved so many people, it was the pacifistic actions of those whose were attacked by the police. This said as much about them as the actions of the police said about them. Those who want to argue that not much as changed, probably didn’t live through the Civil Rights movement. While things are still horribly unfair, and more often than not unequal, we are a better society. Social norms and attitudes have changed for the better, thanks to the peaceful actions of those who stood up and said, “Enough”. To say things need to improve is an understatement. As a country we have a long way to go. Racism may never go away, it seems this is an ugly part of the human condition, but it should never be socially acceptable. As humans we have the capacity to grow and mentally evolve. This ugly feature of humanity should be something we strive to shed. Just as we should shed our idea that violence is a justifiable means to an end; whether you are a cop or an angry citizen. There are other answers. Remember, the world is watching. Your actions speak louder than words. Next Next post: Is it Shakespeare or based on Shakespeare?